One of the big tech news items today is the launch of the much anticipated Google eBooks. Sadly the service is only available in the US at the moment, so I thought I’d have a poke around and see what the hurdles were. Browsing from my regular connection at home I could only see the free (out of copyright in the US) books that have been available for some time, along with a message that ‘The latest Google eBooks are not available for sale in your location, yet…Google is working with publishers around the world to let you buy the latest ebooks from top authors. In the meantime, you can still browse millions of free and public domain Google eBooks and read them effortlessly across your devices‘. Of course I’ve heard this song before (or one much like it) with Amazon. After firing up a US based proxy I was able to browse the new store. I put a copy of Clay Shirky’s ‘Cognitive Surplus’ into my basket (after reading JP’s review of it the other day, and being disappointed that I couldn’t get it as an ebook). The next hurdle was paying. I got a message that the seller (in this case Penguin) didn’t accept cards from my country. I briefly checked out various virtual credit card and prepay card options, but nothing seemed easy or attractive. The workaround I came up with was using an additional card that’s already on my Amex account, along with a US address (Google Checkout already had the details for my main Amex – and that was the card that it wouldn’t accept). I suspect that this may not work for Visa or Mastercard as they issue additional cards with the same number. I could now read my book online (even using a browser with no proxy), but I wanted it on my Kindle. The first step was to download the book. It seems that Google are using Adobe’s DRM (and supported device ecosystem), so I needed to follow the instructions for those devices. After a few hiccups (which I initially thought were down to having my laptop ‘authorized’ to my work email address, but that no look as if they were just flaky DRM server issues) I had a DRMed ePub file in ‘My Documents\My Digital Editions’. I used the Python scripts from this guide to strip the DRM off my ePub file – a pretty painless process. 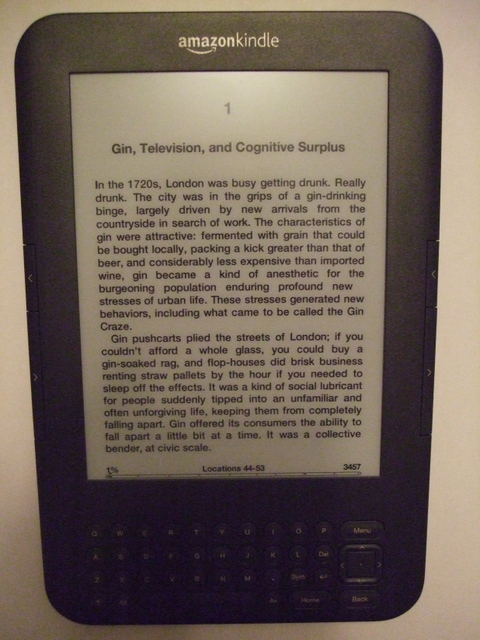 The final step was to convert my ePub file to mobi format so that my Kindle could read it. For this I used Calibre, which looks like an excellent tool with lots of features I’ve not had the time to explore yet. I now have my $12.99 copy of ‘Cognitive Surplus’ on my Kindle despite Amazon, Google and Penguin trying to stop me (though Google and Penguin got my money this time, and Amazon only got 2¢). Update 8 Dec – It seems that in the last few days a UK Kindle Edition has become available. We can now look at the price arbitrage of £12.99 versus $12.99 (£8.54 [or £10.03 if VAT had been added]). I had to install Adobe Digital Editions for this part. I already had it on my laptop, but that initially refused to do the right thing with the .acsm file. Installing on my desktop failed in both Chrome (with Flash enabled) and Firefox (where I don’t run a Flash blocker). Thankfully Adobe do have a regular download link. If you are new to Calibre, then definitely check the ‘Fetch News’ feature. It creates nicely formatted ‘magazine issues’ for your Kindle from a lot of different webpages. Very, very nice.